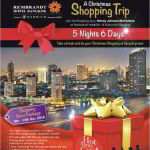 Don’t miss 2014 Christmas shopping at the fabulous Rembrandt Hotel in Bangkok 8th to 12th December 2014 why not join Wendy for a wonderful week of shopping, eating and fun in fabulous Bangkok. Past tours have included Kuala Lumpur with more shopping centres than anywhere else in Asia. A morning cookery course where we got to eat the food we had prepared. A night out with local business women seeing the small businesses they had set up in KL showing us another aspect to this amazing city.A day trip to Malacca. Great photo opportunities of the Twin Tours at night as we lay on our backs at the foot of the towers. December and Christmas shopping in Bangkok is always a highlight even for me, the opportunity to pick up not only bargains but something different to make Christmas a special time. Different decorations, wonderful wrapping paper and even ribbons. Meeting up each evening for pre-dinner drinks and checking out the latest dining sensation as well markets and shopping centres. Another to Vietnam, starting with an overnight cruise on the mystic Halong Bay.Shopping for laquareware, artwork and a myriad of scarves and silk material and eating in Hanoi. On to Hoi An relaxing in the local spas in between tailoring and shoe making appointments. Finally basing ourselves in Ho Chi Minh City for even more shopping and more art work and for tours to the Mekong Delta and the tunnels before returning home with maybe too much luggage from all the shopping opportunities. Sign up for Wendy's Monthly Newsletter.